At first, I thought these comments to be rude and offensive, yet the upvotes suggest that they are not. I guess it's a well-known joke, but searching "blame the Australians" online didn't give me any useful information. My question is: Why are Australians blamed? It's not a well known joke, nor are you missing any nuance of the English language. Presumably Andrew was alluding to an earlier meta thread of his - How come I never see any Aussies on here?, where he put a humorous slant on a genuine question. This would be known as an in-joke - a private joke that can only be understood by a limited group of people who have a special knowledge of something that is referred to in the joke. Specifically this joke is probably based on the fact that Australia is on the opposite hemisphere of where most English-speaking countries are, leading to a running joke of everything in Australia being upside-down. In this joke, the well-meaning Australian wants to upvote a post, but because they are "upside-down", they downvote it instead. What you are seeing is a common construct that ridicules the blame of unrelated groups by sarcastically laying blame when it's understood to be sarcasm. The poster is not seriously blaming Australians. 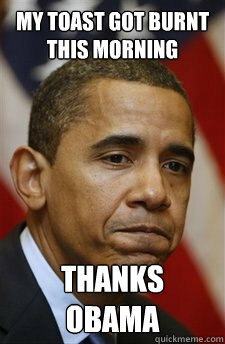 The 'Thanks, Obama' meme is a similar construct that is a response to the American right-wing blaming things on Obama that are difficult to link directly to him, such as the mortgage crisis. In response, the left-wing ridicules it by attaching 'Thanks, Obama' (in a sense: blaming Obama) for silly things like spilling your drink. However, this isn't new and didn't start during Obama's presidency. 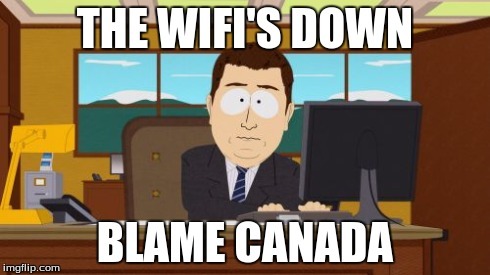 One of the themes of the South Park movie released in 1999 is 'Blame Canada', where the residents of South Park refuse to see that they are the proximate cause of their children's use of bad language, and so they blame the country of Canada instead for a TV Show their kids watch. This is a fairly common turn of phrase in the US -- don't know about England or Australia. For the past eight years, if someone got a flat tire they were likely to tell a companion "I blame it on Obama", even though President Obama obviously had nothing to do with the problem. Starting tomorrow it will be "I blame it on Trump." There is a bit of a social/political commentary involved, in that the blamee is typically someone who does do certain things for which he might (or might not) bear culpability. The use of the trope suggests that the person is something of a scapegoat for every bad thing that happens. The reference to drop bears was the first clue this was meant as a joke. The first couple trips to Australia I was warned about drop bears and hoop snakes. Since almost everything in Australia can kill you I took heed... under every tree I'd be looking and the guys would just be grinning the whole time. The reason it was funny is because there is no such thing as a drop bear or a hoop snake. Joke was on me... Once I got it, it was pretty funny... it was clearly meant as a joke from someone very aware of Australian humor in in no way offensive. Not the answer you're looking for? Browse other questions tagged meaning meaning-in-context phrase-meaning culture australian-english or ask your own question. What are the cultural references in “go back to Jersey you bum” in the Planes 2013 Movie? Why do we use 'of' with accuse while we use 'for' with blame? What does 'Don't blame it on the pig!' mean? WHY “double French ” and what does it mean? WHY to say “a secret prayer” to zip the dress and what does it mean in this sentence? Why to “jump in my grave” and what does it mean in this sentence? Why does he go “pink with the effort” while watching morris dancing?